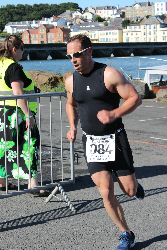 A BIG Welcome to this years Bideford Triathlon, an event which we as organisers want you as competitors to thoroughly enjoy; at the same time raising some much needed funds for the many charities which Rotary supports both in the locality in the form of South West Childrens Hospice, North Devon Hospice, Northam Lodge and Harbour and further afield through projects such as providing Shelterboxes in the event of humanitarian disasters. The Registration point and the Transition Area are situated on the Quay, close to a local landmark which is a statue of Charles Kingsley. Fortunately the Transition Area is adjacent to a decent sized car park and its Long Term Parking area can be found towards the lower end at “Bank End”. There is also another car park at the Old Cattle Market. There are other smaller car parks, but these charge by the hour and this is enforced by vigilant attendants who DO work on Sundays !! Race numbers, swimming caps and timing chips will be given to competitors at the point of Registration. Please try and complete this process as speedily as possible in order that the event is not delayed by protracted Registration. Registration will be open from 0530 hrs on Sunday and will close at 0700 hrs. If you wish to Register in advance on Saturday evening, Registration will be open from 1730hrs until 1900 hrs. This would give you more time on the Sunday before the event. Your bike racking number will be the same as your competition number. We suggest that you bring a waterproof bag or container with you for your kit if it looks rainy on the day. This will keep your kit dry in transition until you need it. Relay Teams should rack their bikes in the designated relay team area. This will ensure that individual competitors will not be impeded at all by other relay team members. There will be a race briefing before the race (Times to be advised). All competitors are advised to attend this briefing in case any changes have occurred due to adverse weather conditions, tidal flow etc. For those novices amongst you please make sure you do a little warming up before the start of the event. Just a few roll downs and stretches followed by a dozen star jumps will do the trick! This will save muscle injury during the race. The Swim will be set off in waves of 20 people each based on reported swim times. Slowest swimmers first. Make sure you listen carefully to the starting marshal. You will swim out from the steps to the first buoy then head up river. Pass ALL buoys on the left that is the buoy should be on your right shoulder as you pass. Anyone late for their allotted swim start wave will have to slot in with the last available wave and will have to forfeit the time lost (ie the chip time will be from your allotted start time. Please Note: The River Torridge is a tidal, salt water river. Taking in a mouthful of salt water can sometimes cause a swimmer to panic a bit due to the coughing and spluttering that can occur. If you do experience any difficulties at all during your swim and feel that you need assistance you should stop,roll over onto your back and raise your arm into the air. Your wet suit should help you float). Swim safety marshals will be watching for this signal and will come to your assistance. After coming out of the water and up the “Gig” steps you will be at the Transition Area. 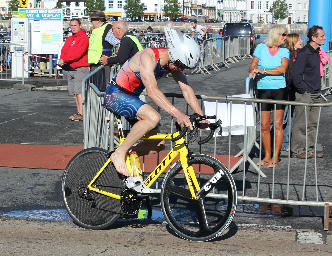 Find your bike, take off your wet suit, put on your bike shoes, put on your bike helmet, (this must be fastened before you un-rack your bike – BTF Rules), then grab your bike from the racking and walk/jog beside it until you reach the mounting line. At this line you can get onto your bike. Note that the mount/dismount line is inside the car park area in order to give you a little time “wobbling” whilst you clip into your pedals. Shortly after the mount/dismount line you will reach the car park exit onto the main road. Between the line and the main road, you must not exceed 5mph. Once you have safely left the car park exit onto the main road you are free to pedal as fast as you wish. Please be careful and look right as you exit the car park. Please stop if requested by marshals as unfortunately traffic does have the right of way. On your return from the bike ride you will be entering the Transition area from the lower entrance by the Kingsley Statue. Remember your position in the Transition Area. If someone else is collecting your bike up for you after finishing, please let them have your race number. Bikes will not be released without race numbers being produced. You must obey the rules of the road at all times. These roads are open to traffic. The bike ride follows the road toward Torrington then turns left through Weare Gifford. There is a sharp left corner and narrow bridge immediately after the turn. Be careful there could be cars coming the other way. Follow the signs through Weare Gifford to Torrington. As you come up to the junction at the end of School lane to turn right through Torrington you must halt and put a foot down. You will get a time penalty if you don't! Through Torrington down the hill then first left steep up then first right to Monkleigh. Turn right to Landcross and left back onto the road to Bideford. Go right to the end of the Quay re-entering transition opposite the post office. Dismount at the line! Walk or jog to your place on the bike rack hang the bike and remove your helmet. Once changed into your running shoes, you will leave the Transition Area via the same route that you did on your bike. 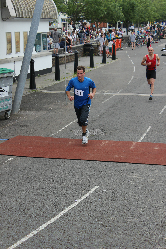 This time, you will leave the car park and turn left onto the pavement and run towards the Old Bideford Bridge. Cross the bridge and at the end of the bridge you will take the sharp left and run parallel to the river for about two hundred metres before taking a left into Ethelwynne Brown Close along which a gate will have been opened for you to join the Tarka Trail which runs adjacent to the river Torridge. Run along the Tarka Trail (westerly) until you reach the designated TURN point and retrace your steps to head back to the Transition Area and the Finishing Line. Once you have finished please return your chip to the finishers area and hand it to one of the helpers there. Prize giving will be in the Finishing Area but there is a possibility that we may be able to hold it onboard the Lundy ferry, “The Oldenburg”, if it is in port that day. We look forward to seeing you on the day which at present is promising reasonable weather…a good start !! Please click on any of the below to view each route map online. (Maximum 250 individual and 30 relay team places available). 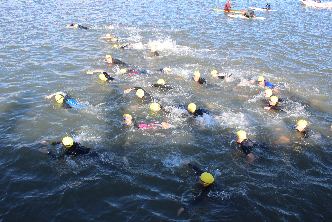 Each person in the relay team will complete one discipline (swim, bike or run). These teams can either be all male, all female, or of mixed gender. 1st 2nd & 3rd place will be awarded to these three categories. Relay team members will not qualify for any of the individual prizes that may be awarded.